GSAT-17 is a planned Indian geostationary communications satellite. It will provide replacement capacity supporting the existing television, telecommunication, Digital Satellite News Gathering (DSNG) and VSAT services in the country. The GSAT-17 will provide replacement capacity in different frequency bands and protect operational services. It will also augment and support existing telecommunication, television and VSAT services in the country, apart from providing in-orbit redundancy for societal services. 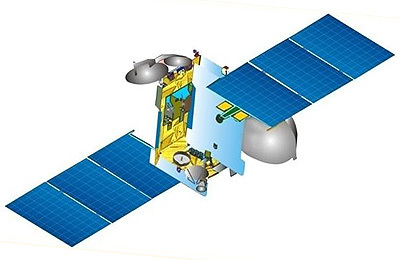 The footprints of the GSAT-17 spacecraft will cover the entire mainland of the country. GSAT-17 is based on the I-3K bus with a launch mass of 3425 kg and 6 kW power generation capacity. The satellite carries a payload consisting of 24 C-band transponders, 2 lower extended C-band transponders, 12 upper extended C-band transponders, 2+2 MSS (forward & return link) transponders, and one DRT and SAS&R transponder. The satellite was approved in May 2015. It will be constructed during a period of 30 Months for a launch in late 2017.